I like to prepare a few of these parcels in the morning. They are great to have ready for those little hunger attacks during the day. You can use any kind of raw vegetable you like as a filling, but this one is my favorite combination. 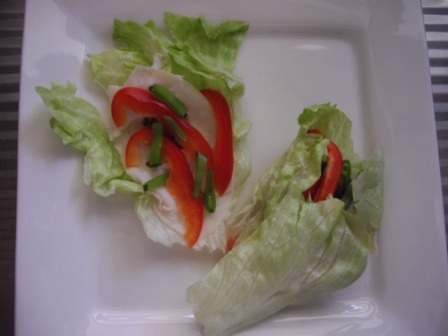 Gently take off the outer leaves of an iceberg salad and fill each leaf with slices of deli chicken, red capsicum and snow peas. Gently fold each leaf together and place them tightly in a container so they won't fall apart. You can also secure them with a toothpick but don't forget to take them out before you eat your rolls! Add a little mustard to spice things up. You can also use other lettuce such as baby cos.